We have a kelly green stole with royal blue trim for a sensational way to represent yourself. Graduation is finally almost here, be sure to get all of the gear you need to be ready for your graduation ceremony. We know just how difficult it can be to stay focused and successfully reach your goals of graduation, it takes years of dedication to earn your degree or diploma. Here at Honors Graduation we have made it as easy as possible for you to put your graduation outfit together. It has been a tradition for a number of years for graduating students to dress in a graduation cap and gown at the time of their ceremony. Your friends and family will travel from all around in order to show how proud they are of you and help you enjoy your celebration. Many graduating students like to add a graduation accessory to their outfit for various reasons. At Honors Graduation we have all the accessories that you might want and bundle deals including the essentials that you need. Our graduation stoles are an ideal way for students who have earned a special achievement to symbolize it. Here at Honors Graduation we have a variety of options to choose from to help you to create the best stole to go with your outfit. We have eighteen colors to choose from for both the main color as well as the trim. 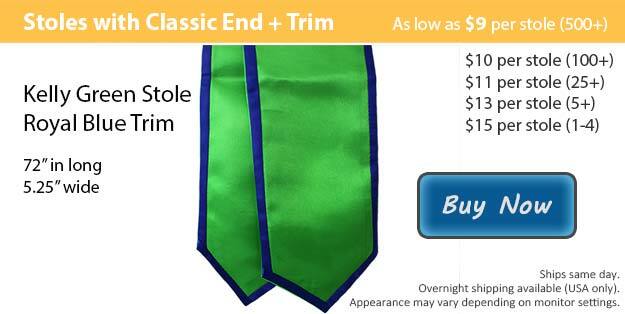 We offer two types of graduation stole, we have the classic finish as well as the angled cut. Both stoles are available in lengths of either 60 or 72 inches. All of the stoles that we have available can be purchased with or without the trim. We even do custom stoles for a small additional price. Our customization team uses embroidery to add whatever image or wording that you would like right onto your stole.